All I can say are that these are the coolest headphones anyone can ask for and I believe they should be sold at the coolest stores around the world – Colette,Merci,Opening Ceremony, Fred Segal, Selfridges, All Saints, House of Fraser, 10 Corso Como – sneaker shops, record shops Amoeba in LA -anywhere cool! 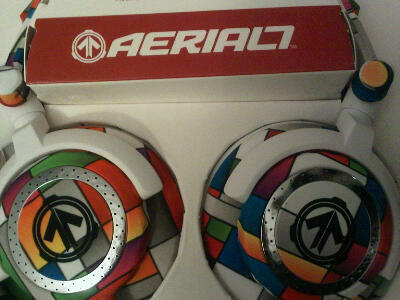 These headphones are not only well designed, artistic, colorful, geometrically cool, they are FUN! They put a smile on your face. You can tell who designed them because he is a designer + stylist + dj that not only thinks of a cool way to do things but always has a smile on his face. 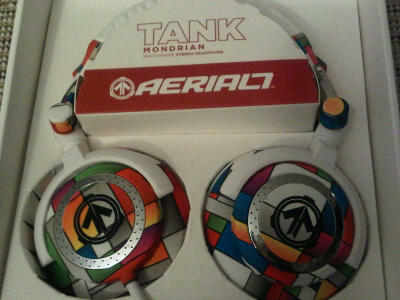 Everyone who listens to music or watches dvds while travelling – get these Aerial 7 Tank Mondrian Headphones designed by Josh Madden. Also he has a radio show – check it out – I think he has a link at www.joshmadden.com. Check out more on Aerial 7 at http://www.Aerial7.com and buy yourself something for the New Year – these awesome headphones! Oh and me + djing. I plan to do more of it in 2011. I originally did it as a test to see if I could figure it out but not doing it for a while I miss it. 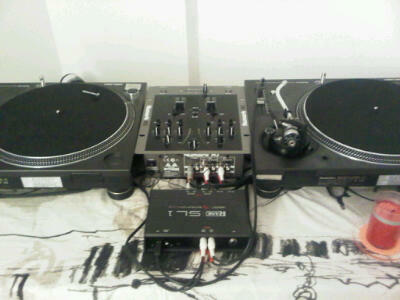 So one of my buddies is about to teach me everything from mixing to how to set up equipment. I hope to dj a party mid January with my new headphones of course!